There are so many people in the world who specialize in organizing, planning, decluttering…keeping us on task. And this is a helpful role to fill. But whether the person in your life who does this is a professional organizer, or your mother, spouse, friend, or boss, there is one thing that people who try to keep us on task, and who look judgmentally at our current state of disorganization, tend not to understand. And that is this: disorganization frequently does not stem from being irresponsible, or from not caring, or even from having a disorganized brain. Disorganization, quite often, comes from being overwhelmed with emotions. Any emotion, positive or negative, can take over and disrupt our schedules and our day. It could be excitement over having met someone new. It could be a long standing depression or feelings of worry and anxiety.But these feelings are shorting out our sensitive nervous systems and making it hard for us to concentrate — maybe even just making us want to sleep, instead! 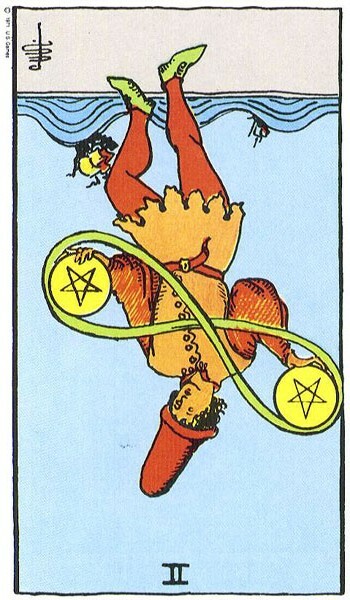 Today, this is what I see happening: we’re trying to juggle multiple responsibilities (Two of Pentacles), but the past, especially feelings from the past (Six of Cups), are getting in our way. They are distracting and disruptive, even when they are positive. In some cases, it isn’t just feelings from the past — in some cases, we are still juggling extra balls from the past, in the form of debt, or promises that we still need to keep, or old papers that we have to sort through because something important might be squirreled away in there. But our feelings about these things aren’t helping us to focus. I have several suggestions to offer you to help in getting through this day. First of all, taking some time, even though you are already behind schedule, to center and meditate, exercise, or do some self-hypnosis, will help. I turned to self-hypnosis myself this morning in desperation — picked a short hypnosis track off my iPod, got very into it, and then listened to Dire Straits (“Walk of Life”) to wake me up so the hypnosis wouldn’t put me straight back to sleep (a distinct danger). It helped — so much that I wasn’t in as big of a hurry as I usually am for a cup of coffee. 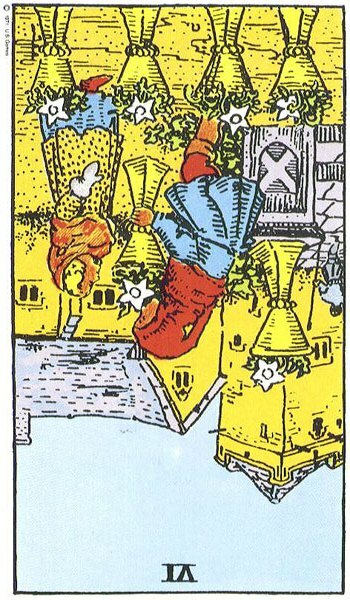 (Though, if you are planning to give up caffeine, you might want to wait until tomorrow…and if you are on medication for ADD or ADHD, don’t skip that medication today!) On a day like today, you might even have to stop to do something centering such as hypnosis, or exercise, or both, several times during the day. It’s worth taking the time for these kinds of activities if they help you to let go, relax fully, and then be better able to concentrate afterwards. I could say, try to let go of the past, but it’s not that easy, is it? Still, if you can relax fully, you may be able to at least let go of the hold that tension from past events has on your muscles. Then, turn to those calendars and to do lists that the well meaning organizer people are always pushing and see if those tools may actually help. But, slowly we go. Don’t expect to do a thousand things at once today. If you single task instead, and slowly steadily do one thing at a time, you may find that you are able to accomplish more than you expected to today. Good luck.